In my Introduction to Permutations post, we have learned that the number of permutations (or arrangements) of objects taken at at a time written as is equal to , and we have also learned that the number of permutations of objects taken at a time written as is equal to . In Figure 1, shown are the permutations of letters, A, B, C and D taken at a time. From the figure, we can see that there are indeed of such arrangement. In Figure 2, shown are the permutations of letters taken at a time, and we have shown that the number of permutations is equal to . In Figure 3, we have again listed the permutations of letters taken at a time, and have shown that the number of permutations is equal to . 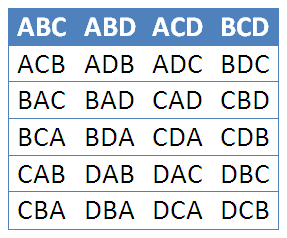 Figure 1 – Permutations of ABCD, taken 4 at a time. Figure 2 – Permutations of ABCD, taken 3 at a time. Figure 3 – Permutations of ABCD, taken 2 at a time. If we talk about combinations, however, the arrangement of objects does not matter. For example, if we want to buy a milk shake and we are allowed to choose to combine any flavors from Apple, Banana, Cherry and Durian*, then the combination of Apple, Banana and Cherry is the same as the combination Cherry, Apple, Banana. Try to list all the possible combinations of flavors taken from before proceeding. If we choose to shorten the name the fruits by selecting the first letter of their names, we only have possible combinations for question above: ABC, ABD, ACD, and BCD. Notice that these are the only possible combinations. 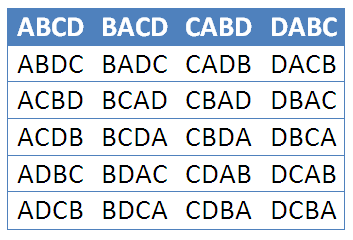 Also, observe that if we list the permutations of ABC, we have ACB, BAC,BCA, CAB and CBA. This means that in permutations, we have counted each combination of flavors from flavors times (or times instead of one. In other words, a combination is just like a subgroup of a group. For instance, if we want to find the number of subgroups containing objects taken from objects (or the combination of objects taken at a time), it is the same as asking “how many possible groups of objects can be taken from objects?” In Figure 4, all the possible subgroups of letters taken from letters are displayed by the orange border. You also would have realized that the number of permutations is an overcounting of the number of combinations. Figure 4 – The combinations of 4 objects taken 3 at a time is the same as the number of subgroups of 3 objects taken from 4 objects. In general, to get the number of combinations of objects taken at a time, we have to divide the number of permutations of by the number of permutations of the subgroup . *Durian is a fruit which can be found in the Philippines. It looks like a jackfruit.